Since its founding in 1998, DRLPS has had a dedicated group of hard working and highly competent volunteers who functioned as a team. The results of the efforts of the DRLPS Team have been significant recognition for their accomplishments. The history of this recognition is detailed below. Over the years, DRLPS has filed applications for a variety of reasons, e.g., grants, transfer of the lighthouse ownership, listing on the National Register, etc. Most of these applications required ‘letters of support’ from esteemed people involved in lighthouse preservation. From these letters we have gleaned some noteworthy comments that praise DRLPS. Some of these comments are recorded here. Recognition is a two way street. Much of the success of DRLPS must be credited to the many individuals in the national lighthouse community and governmental agencies that have supported our cause. Here is the acknowledgement list (coming soon) of our enthusiastic supporters. Our members have been steadfast in their support. DRLPS wishes to thank all of you for your support over the years. September 28, 2013- DeTour Reef Ligh Historical Marker Dedicated: The Michigan Historical Commission (MHC) of the Michigan Department of Transportation has recognized the DeTour Reef Light Station as a significant part of Michigan’s history by awarding it an official State of Michigan Registered Historic Site (#2252) historical marker. 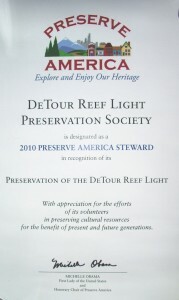 The designation honors the DeTour Reef Light Station as an important and educational part of local and state history. August 2, 2010) –Preserve America Stewardship Award: First Lady Michelle Obama honored DRLPS by designating the Society a Preserve America Steward. “The places you care for hold a treasured place in the American story, and it is through your vision and dedication that our history will be upheld and our future will be renewed,” First Lady Obama’s letter states. Dave Bardsley, DRLPS Vice-President, receives the Community Pride Award on behalf of the DRLPS from Dave Firack, President and CEO of Old Mission Bank. September 23, 2006 – AGLMH Award for Historic Preservation: The Association for Great Lakes Maritime History (AGLMH) presented its prestigious 2006 Award for Historic Preservation to Dr. Charles Feltner at its annual meeting held on September 23, 2006 at the NOAA Great Lakes Maritime Heritage Center in Alpena, Michigan. 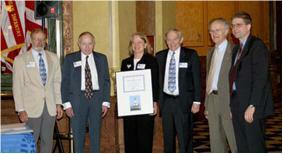 Dr. Feltner was recognized for his contributions to maritime historic preservation spanning over 25 years. His most recent efforts as Restoration Chairman for DRLPS focused on a more than $1 million dollar restoration of the historic DeTour Reef Lighthouse. 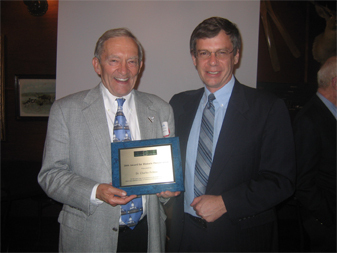 Dr. Charles Feltner, Restoration Chairman and Past President of DRLPS, receives the AGLMH 2006 Award for Historic Preservation from Bob O’Donnell, Awards Chairman, the Association for Great Lakes Maritime History on September 23, 2006 in Alpena, Michigan. 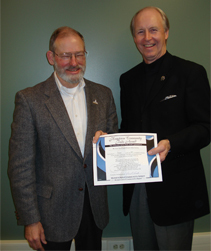 June 24, 2006 – Historical Society of Michigan Superior Award: DRLPS was selected by The Historical Society of Michigan (HSM) to receive its preeminent Superior Award. This award recognized DRLPS for its achievements in preserving and advancing Michigan’s Upper Peninsula history. Click here to view a copy of the certificate presented to DRLPS.At the Superior Awards ceremony at the Bonifas Art Center in Escanaba, Michigan on June 24, 2006 are (l to r) Sean O’Neill-HSM President, Jeri Baron Feltner-DRLPS Founding Director, Chuck Feltner-DRLPS Chief Historian and Past President, Robert Myers-HSM Trustee, and Larry Wagenaar-HSM Executive Director. May 19, 2005 – Governor’s Award for Historic Preservation: DRLPS was selected by the State of Michigan to receive the Governor’s Award for Historic Preservation. Created in 2003, the annual Governor’s Award for Historic Preservation recognizes individuals, developers, corporations, academic institutions, and units of government that have undertaken rehabilitation of historic resources or archaeological excavations, or implemented sound public policy to promote preservation. Through these awards, the governor seeks to draw attention to historic resources’ unique potential for economic development as well as to the important role these resources play in defining our communities. Click here to view a copy of the certificate presented to DRLPS. At the Governor’s Awards ceremony at the State Capitol Rotunda on May 19 (l to r) Dave Bardsley-DRLPS President, Clif Haley-DRLPS Grants Chairman, Jeri Baron Feltner-DRLPS founding Director, Chuck Feltner-DRLPS Restoration Chairman and past President, Dr. William Anderson-Director of Michigan Department of History, Arts & Libraries (who presented the award), and Senator Jason Allen. March 15, 2005 – Listing on National Register of Historic Places: The DeTour Reef Light was officially listed on the National Register of Historic Places (NRHP). Established under the National Historic Preservation Act of 1966, the NRHP is the nation’s list of cultural resource properties of national significance worthy of preservation. It is a program of the National Park Service, U.S. Department of the Interior. In Michigan, the State Historic Preservation Office administers the program. The resources listed on the National Register illustrate and commemorate our nation’s past, and history lives on in its historic places. Listing on the National Register honors a historic place by recognizing its importance to its community, State, and the Nation. The registration application was authored in the summer of 2004 by Dr. Daniel Koski-Karell, Environmental Management Division, USCG Headquarters, with assistance from Jeri Baron Feltner, Director and Secretary of DRLPS. November 2, 2004 – Special Tribute from State: DRLPS was given a Special Tribute from the 92nd Legislature of the State of Michigan endorsed by Jennifer Granholm, Governor of Michigan, Jason Allen, State Senator 27th District, and Scott Shackleton, State Representative 107th District. The Tribute states that, “For over six years, the DeTour Reef Light Preservation Society has pursued all possible means of achieving their goal of preserving and restoring the lighthouse. The founders work relentlessly to increase membership and raise awareness in the community for their cause. Not only has the society received support from their community and financial donations from local businesses, they also have members from twenty five other states. The preservation society has become a “poster child” for Michigan lighthouse preservation groups due to their success as a strong, volunteer based organization. This success is based on the unfailing dedication and determination of the volunteers, as well as the loyal support of lighthouse enthusiasts.” Click here to see a copy of the certificate. 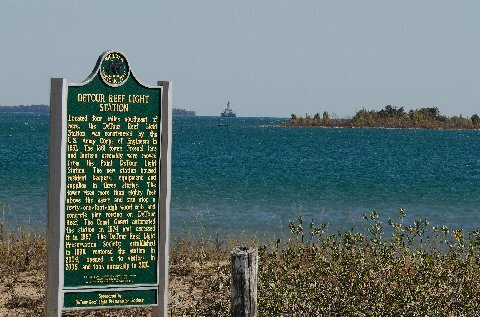 June 15, 1998 – NRHP 11 Most Endangered Places: The National Trust for Historic Preservation named Michigan’s Historic Lighthouses, Exemplified by the DeTour Reef Light, as one of America’s 11 Most Endangered Places. For the complete story, go to America’s 11 Most Endangered Places, scroll down the list to the “M” section and click on Michigan’s Historic Lighthouses, Exemplified by DeTour Reef Light. On the day that the National Trust announced this list, the National Public Radio show “All Things Considered” interviewed Dr. Charles Feltner, DRLPS Chief Historian, to get his reaction to this announcement. Click here to listen to this four minute interview.